Wellness director Connie Cheng shares the benefits of incorporating spinach into your diet. National Spinach Day is March 26th! There are a lot of added benefits with adding spinach into your diet. Spinach restores energy and improves the function of red blood cells and is also very high in Vitamin K which is essential to bone health. Plus, a lot of other key nutrients and essentials vitamins are found in spinach too including iron, folate, and Vitamin B2. Connie Cheng, Gold’s Gym wellness director, share her tips on how to cook spinach and the key benefits incorporating into your diet. Connie shares her 4 simple tips on how to cook spinach. 1. Do not wash spinach before storing because moisture causes spinach to spoil. 2. Lightly cooking or wilting spinach will help your body absorb the iron better by reducing the escalates which inhibit absorption. 1 cup of cooked spinach is approximately 75% of iron needed for older men and women and 33% of iron needed for women between the ages of 19-50. 3. Avoid boiling spinach because it will eliminate a lot of its nutrients. 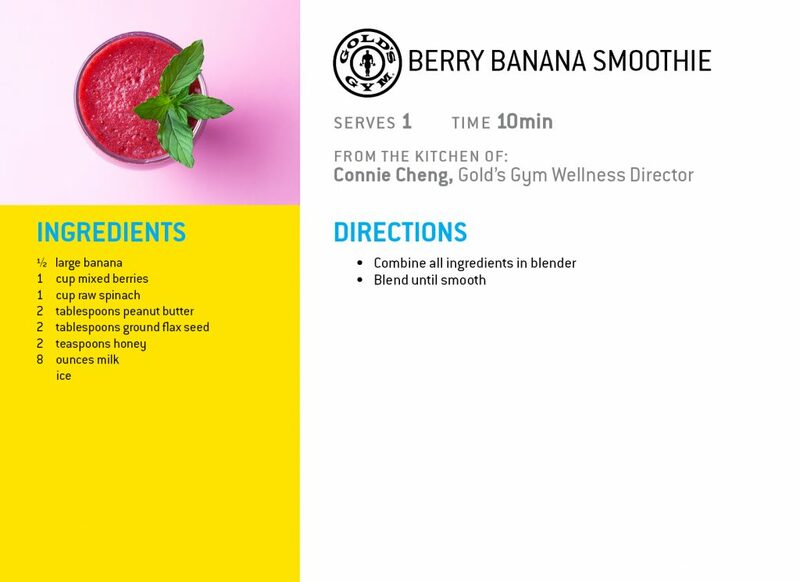 Now that you know how to cook spinach, try Connie’s Berry Banana Smoothie! It’s the perfect way to sneak in a serving or two of spinach. See more of Connie’s favorite spinach recipes, including a healthier alternative to classic spinach artichoke dip.